Gulf Harbour Rigging was established at the Gulf Harbour Marina in 1988. The business originated in Auckland in 1971 as Terry Gillespie Ltd, founded by Terry Gillespie, whose name is synonymous with yacht rigging in New Zealand. The ownership changed hands in September 2010 when Phil Ash purchased the assets of the company and took over the lease on the premises. 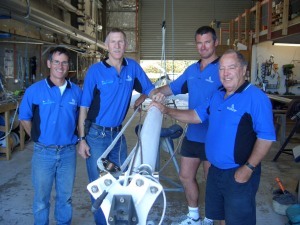 Owner Phil Ash has run the rigging workshop at Gulf Harbour since 1996. Phil has been sailing most of his life, starting out in a P Class dinghy in Wellington harbour in the 1960’s. He moved on to keelboat sailing, as well as continuing to race numerous dinghy classes. Phil worked as a sailmaker and loft manager for Hood New Zealand in the 1970's, and was fortunate enough to get to sail with many of New Zealand’s well known sailors of the 70s and 80s. Phil spent over ten years on the US west coast involved in the marine industry working on new boat set up, rigging, and general maintenance of boats in between racing and delivering yachts around the Pacific. He has a wealth of offshore experience in races such as the Transpac, Sydney / Hobart and Pacific Island races, as well as numerous California to Mexico races and deliveries. This has given Phil an appreciation of the importance of a well maintained yacht and rigging. Rob Croft is a Yacht Rigger who can also provide the experience gained from many years of sailing. He has cruised in the Pacific and Indonesian waters, and raced his Farr 38 ‘Coppelia’ to success in local and offshore events. He also cruises his boat around the Hauraki Gulf, and competes regularly on a number of different local yachts. He has raced internationally in one design class World Championships, and raced and delivered Superyachts, including racing the Transatlantic and Sydney / Hobart races. Rob has completed an extensive refurbishment of his own yacht, and is familiar with all aspects of yacht maintenance. His ‘big boat’ experience has given him an appreciation for the extreme loadings that ropes sometimes encounter, and he takes pride in his ability to splice lines that “stay spliced”! Brett Mills is our resident welder and a qualified Fitter and Turner by trade, and was previously employed sparmaking and rigging at Yachtspars NZ for over 15 years. Brett has a Commercial Launch Master qualification, and has a diverse history of racing and cruising yachts of many sizes, including having delivered a 24' 1/4 tonner down the west coast of NZs north island from Auckland to Nelson! He currently owns a small Alan Wright designed Pacer yacht, and enjoys participating in local club racing on different yachts. Our office and accounts management is handled by Kerry Davies who has been involved in the New Zealand marine industry for most of her working life. Kerry owns and races an Alan Wright designed Marauder, and was on the helm for wins in the National Championship in both 2011 and 2012. Kerry has also been active in women's racing aboard a Platu 25. 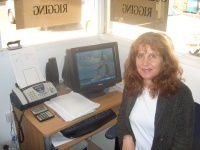 For those customers who have known us for many years; we can say that former owner Terry Gillespie has now hung up his Bosun's Chair after 40 years in the rigging business. Terry prefers to spend more time fishing and golfing nowadays, but is still only a phone call away when former customers and friends come by, or if we need to tap into his extensive internal 'database'!